I thought LMF had done a good job last year, plus fly past was spot on. Seems a shame as LMF stepped in when Billing weren’t interested. What happens if Billing changes mind in 2 years time and kick VBOA out again? Hi everyone! First off all excuse me for my english if you see some uncorrect words. 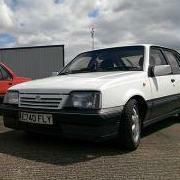 I am from Bosnia and I own a blue 86 Opel Ascona wich was my first car even tough I started driving 6-7 years ago, but my father had one back in 98 so it is in our blood :D. After I bought Vectra b 2 years ago the Ascona was no longer in use so now I am coming back to her and I need so much infos about that old lady so I hope I am getting help from you, and I am thankfull for letting me do that. Pictures very soon ! Cheers! Replaced the clutch set yesterday, it was worn to the bone, its a new car to drive now, still getting used to the new clutch as it is soft and sensitive now. Also took a 300km drive to the seaside to visit some friends. Thank you for your kind words and support! Happy new year aswell to everybody! As seen on the pictures, the underside ( and trunk ) has been painted, to a dark grey colour. I've also drawn some circles around some holes. I dont think it would be smart to leave these like this, but cannot recall if they had something in them from the factory or not? Ofcourse i mean only those that are just holes, not the ones meant for bolts. F16, in future it will be replaced by a F18 gearbox with cable gearshifter from vectra/astra. Bit of an update this morning from VBOA. As before, we will only let our paid up members on the stand. Thank you to all who have passed the information around to their clubs, such that ticket purchasing has started. From that we have had some feedback, and we have some to pass to you too. Firstly there has been some concerns over how club affiliated attendance is "policed". This will be carried out in more or less the same way it has always been. Its an honesty based system where the person states they are from XYZ club and when they arrive they a) go to that club and b) are supposed to be there. We the VBOA do not verify club membership for purchase/entry based on what the ticket purchaser selects. Secondly, some people have asked or rather were discouraged when it came to booking the tickets as it was understood that Ticketease requires a Facebook account to login and buy. This is not the case. It would appear that they would like you to login with your Facebook account BUT this is not required, there is the alternative method to login (as normal for many, with an email address etc). Took me 4 days to get it all sanded and all the little rust spots removed. At least those i could see. Ive also brushed seam sealer all over the place, which made it look horrible now, but i think another layer of white will not harm anyone. Question aswell. What colour should I paint the underside? I dont think white would be very practical, but if the underside would have been white from the factory then... Another recommendation I got was to do something with the sunroof drainage pipes at the front. From factory they just end at the inside of the sills. No go, I have sealed those completely, the water would have no escape from there. So maybe an attempt to shorten them, continue with softer and smaller diameter pipe/hose, and guide those to the wheel arch? Painted and covered with stone protection. Im going to add another layer of paint on top of it, that is when im done sanding the inside of the car, and painted that with primers. The first I knew was an email at 21.40 that I read half an hour ago. Sounds as if it could have some potential from an initial read. This is it. Good Evening, For the purpose of clarification, when the term “we” is used, it is to refer to the VBOA committee of the Chairman, Vice Chairman, Treasurer, Secretary and the Event organisation sub-committee. Please read this all the way to the end as there is quite a lot to digest. Voting on the Billing Options The voting and feedback from the two Billing options has been received and of those clubs who responded there is an even split between Option 1 and Option 2, with further feedback from some that neither is tenable resulting in a desire to not show at all. Outcome of the feedback/vote With the results in mind, and taking into account the feedback received from individuals both on social media and direct to this email address, we have deemed it vital to seek out an alternative venue that carries neutral allegiance. To some, this will be viewed as a non-democratic decision, but we feel that attending either Billing or Market Harborough would damage the VBOA and its associated clubs in such a way that recovery would be very difficult. The venue that we have visited, discussed with the management and decided upon is Sywell Aerodrome (http://sywellaerodrome.co.uk/, Hall Farm, Sywell, Northamptonshire, NN6 0BN). This venue has held several automotive events each year, with a prime example being the Sywell classic also known as props and pistons which would be the closest representation to the VBOA National Rally. Goal of the VBOA Show The prime goal for this is to take all the good from Billing and Market Harborough and improve on the not so good (toilets being the most obvious one). We also want to try and bring the general public/car fanatics in, so an element of rebranding will be carried out to step on from the term rally implying a motorsport event to a motor show. The identity of the VBOA National Rally shall not be lost, merely built upon to take it to a new level Venue/Show concept We are looking to hire the venue exclusively for our use for the 5th-7th July 2019, where we will use at least two of the hangers (one is a bar/band area and carpeted), and the other can be for the auto jumble/trade stands so as to protect from any inclement weather. We also intend to make use of the concrete pan for the arena/food vendors akin to previous years which seemed to achieve the festival vibe that has been mentioned. Furthermore we intend to make use of the taxi way to have a 0-60/drag activity, this could also be a part of the parade lap should the desire be there. The attached maps are a high level first pass at how the show could be laid out and given the space available, you would get the same stand sizes and setup (camping on stands) you have enjoyed in previous years. The only exception to this may be that if electric hook-ups are needed for things like caravans, then this would be in a single location with a limited number of pitches available. The space available for the show between the Arena and the far fence, to the North East, (or even the little roadway in from the entrance) is comparable to the area we had at Market Harborough. We do not have a layout for stands as yet but this will be high on the list of things to do and this will come out in time. Also attached is an image from the LAA show there which is focussed on aircraft, but it shows an aerial shot of just what is possible there. As this is an Aerodrome and not a purpose built camp/leisure facility, we will need to supply a myriad of things such as toilets/showers/PR/food vendors/entertainment/security and so on, if YOU or YOUR members can assist in the supply of this or anything else then please come forwards, this show will only be as good as we can all make it so the more involvement the merrier. Hotel We understand that many of you and your members have already booked rooms at the hotel at Billing. Billing is approx. 10 Minutes away from Sywell, and we would look to put on a bus service of some sort for the weekend if the demand is high enough. Sywell have a 59 Room hotel on site, they have fixed their prices at £79/Night with breakfast at £8.50/Person. As they only have 59 Rooms, we suggest you book sooner rather than later, also do this direct with them and NOT Booking.com (http://www.aviatorhotel.co.uk/contact.php or 01604 642111) Entry costs Now, the costs (some of these will be subject to change) Day entry for VBOA members (1 car + 4 people) will be no more than £10/day and working on a weekend entry pass too. Day Entry for General Public (1 car + 4 people) £15/Day Camping would be sold as a Friday-Monday (1 car + 4 people) at approx. £45 Additional car costs will be considered and information will be released but will be favourable. We are looking at options of early bird pricing and also giving 1 weekend camping pass per club as we used to have at Billing. This booking process would be using a dedicated booking agent that links directly to the VBOA. Support As has been mentioned, there is and will be quite a lot to do to make any show at any venue work, even if we were back at a purpose built site for this type of thing, so we need your help. Helping does not mean you or your members are stuck with a job/task for life, it means that you have helped to make the show as good as can be. I have seen a sign in my local rugby club that says “before you complain, have you volunteered to help?”, I think this is a very valid and wholesome approach to anything like this. There is of course much more to plan, prepare and do prior to the show and this is only the start of all the information that will come out, but it is everything we know at this present time. Kind Regards Stuart Lindborg Vice Chairman – On behalf of the VBOA Committee and Event Sub-Committee. It looks like the new management team have cottoned on to the fact that having some free (to the residents) onsite variety shows, like car clubs, is a really good differentiator for them compared to their, at least two, competitors in the area, one of similar size. Its win win for them as they make money on them as well. I suspect they got some pretty nasty feedback from their residents the year all the shows disappeared. i can see the benefits of billing, its just like facebook, its a destination site regardless of car stuff going on. you coud say billing is great for people who have to go to a car show that don't like car shows. 😀 MH felt more close knit, like a festival. its weird that the minutes of the last meeting said that MH 2018 was the best vboa rally in 15 years (and 13 of them were at billing) anyhoo. in order for us (the royal us, old vauxhall brethren) to have a billing exactly like 2016 and before, i.e big show ground, camp by your cars, will require vboa paying billing a huge lump in advance to book the site, one that i know vboa cannot cover. Therefore vboa will need clubs to pay in advance, its a huge financial outlay for a club which they probably cannot afford either, so then individuals have got to pay their clubs in advance, actually commit and pay (in this case before the end of the year). i cant speak for mk2cav, but our club people are usually scrabbling for last few tickets right up to the dying days before the event. the alternative no cost option billing, we will be tourists at billing, have to book via billing, get assigned a camping spot not necessarily with your friends or clubs, and that camping spot will be in isolation from the car showing area. showing area much smaller for same reason. at night you will have to leave your car under the careful gaze of Kai and sammy-joe in their transit tipper, or move it back to where you are camping. Right thanks for clearing that up John. I had heard rumours that they approached us not the other way round. Thats the old chinese whispers at work then. What was so wrong with MH? I thought most people seemed happy with the progress of changes at the new site. To reiterate Paul's comments though, you are the man for the reps job. I appreciate its not always easy though, but you have my full support in whatever decisions you make on the clubs behalf. Thanks Paul. No haven't been recently but as I mentioned in answer to Chris's comments the site has changed with much more hard standing sites. All the car shows are now down the turn left after you get onsite. Straight ahead, where VxON and multi Astra sites were is now gone. Where we get our stand is in the lap of the gods but I will try to get us the same location but it is highly likely to be smaller. Its been put to me this morning by more than one paid member of the club, that shouldn't our vote have been discussed between paid up members on here and then put forward at the VBOA meeting? Keir, meet up. Yeah. I shall make a point where and when mate.